The biggest cut from your pay check. US annual cost of housing, 2016. US households spend one-third of their paycheck on housing, and the biggest expenses are mortgage, utilities, interest & property tax–in that order. On an average, a US household spends $1574 on housing every month. This includes everything one needs to live in house: from mortgage to furniture to phone bills. The biggest part–almost two-third–of this bill is paying for the loan taken on the mortgage. The next big expenses are paying for utilities, which includes electricity, water, sewerage, etc. Taking the average of all housing across US, two-third of the dwelling expenses are related to owning a home & one-third for rents. This is consistent with the fact that average US home ownership is about 63%. A monthly property tax of $164, mortgage interest of $241, and insurance plus maintenance expenses of $120 make owning a house less appealing. In shared dwellings, charges of home owner’s associations further discourage young families to own their own homes. This data also shows that on an average, a US household spends almost $240 a month on phone, internet and related cable connections. 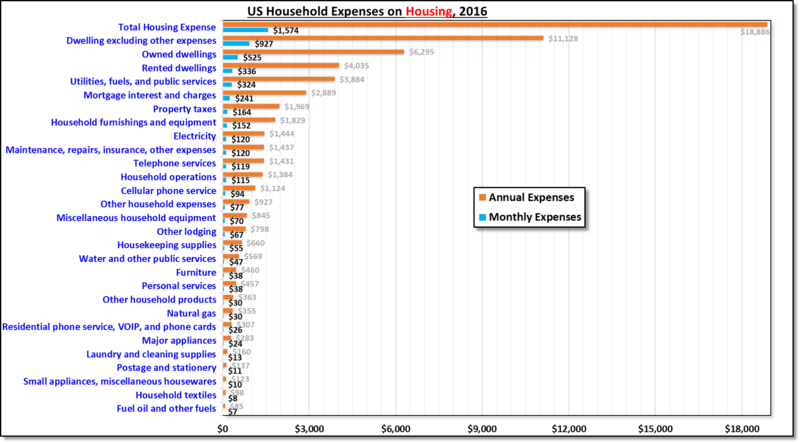 Although US annual cost of housing varies significantly across the country, this chart is a good benchmark to compare your numbers against the average expenses for 125 million households during 2016.